Factor X have we finally found the fountain of Youth? Discuss life, the universe, and everything with other members of this site. Get to know your fellow polywell enthusiasts. Re: Factor X have we finally found the fountain of Youth? Diogenes wrote: I think I saw that movie. Didn't seem to turn out all that well. Huh? The underdog rebels won! But not until after a long duration of suffering, and pretty much thanks to random chance. The possibility that a deus ex machina might rescue a future mankind from oppression is not a strategy that I would like to follow. I perceive that much of the elite and wealthy are genuinely Malthusians at heart. All of the things they support appear to lean in that direction. That is something I thought we would see eventually. A linear projection of the state of the art would indicate we would eventually be able to custom build molecules to meddle in any biological process that we wish. Now of course, mankind is going to turn it into a weapon that kills specific classes of people based on their genes. But that could just be my cynicism talking. Effective and hopefully safe vaccines available about a week from initial outbreak, very good news. Same tech as a selectively targeted bio-weapon, not so good. The daylight is uncomfortably bright for eyes so long in the dark. hanelyp wrote: Effective and hopefully safe vaccines available about a week from initial outbreak, very good news. Yes it sounds good...but I am wondering why they mentioned in the link relatively obscure diseases like Ebola being tested (& yes common Influenza), but no mention of say HIV or Malaria? hanelyp wrote: Same tech as a selectively targeted bio-weapon, not so good. Not so sure how well that would work anyway although admittedly a concern. If I was trying to kill a particular individual in a high tech kind of way some kind of swarm of insect size (or smaller) programmable or directed drones would work better. If I was trying to target an "ethnic" group like say "Muslims", too wide of a genetic net to be practical I would think, though I could be wrong. Most people while they may consider themselves to be "white", "black", "Hispanic" etc., are actually far more genetically mixed than they realize. Hard to target a germ/vaccine to be that specific; and even that isn't considering the possibility that your hypothetical "tailored" germ might not mutate (especially if its a virus) into something more generally virulent once it had greatly multiplied & infected enough people. Not so sure how well that would work anyway although admittedly a concern. If I was trying to kill a particular individual in a high tech kind of way some kind of swarm of insect size (or smaller) programmable or directed drones would work better. I agree with you about the swarmbots. I was just scaring some of my friends with this very discussion earlier today. Soldiers cannot fight against swarmbots. Cheap, easy, and deadly. I see this coming as a very probable battlefield weapon. You can't hide from them either. They effectively neutralize any quantity of boots on the ground, in the air, or in armor. williatw wrote: If I was trying to target an "ethnic" group like say "Muslims", too wide of a genetic net to be practical I would think, though I could be wrong. Most people while they may consider themselves to be "white", "black", "Hispanic" etc., are actually far more genetically mixed than they realize. Hard to target a germ/vaccine to be that specific; and even that isn't considering the possibility that your hypothetical "tailored" germ might not mutate (especially if its a virus) into something more generally virulent once it had greatly multiplied & infected enough people. If you are a Malthusian, target wide, and provide an "antidote" to the people you want to keep. Location: Third rock from the sun. Using a combination of Y-DNA and an mtDNA indicators you could take out a family line quite easily . I am not a nuclear physicist, but play one on the internet. williatw wrote: ...Most people while they may consider themselves to be "white", "black", "Hispanic" etc., are actually far more genetically mixed than they realize. I don't expect that's a problem for a genocidal madman with delusions of genetic purity. If you carry the genetic marker for the target your blood is "dirty" and needs to be "cleaned". And that's an advantage of a bio-tool consisting of packaged mRNA, it invades cells, produces the desired protein, and that's it. No chance of spread beyond the initial exposure. When Brian Hanley set out to test a gene therapy, he started with himself. Church has said he thinks the gene therapy is “underrated” as a way to conquer old age and believes in a not-so-far-off scenario where “everyone takes gene therapy” not in order to cure hemophilia, sickle-cell anemia, or some other rare disease, but to reverse the results of getting old. n a dream Brian Hanley told me about, he’s riding a bus when he meets a man in dark leather clothing. Next thing he knows, he is splayed across a tilted metal bed, being electrocuted. The dream was no doubt connected to events that took place last June at a plastic surgeon’s office in Davis, California. At Hanley’s request, a doctor had injected into his thighs copies of a gene that Hanley, a PhD microbiologist, had designed and ordered from a research supply company. Then, plunging two pointed electrodes into his leg, the doctor had passed a strong current into his body, causing his muscle cells to open and absorb the new DNA. The effort is the second case MIT Technology Review has documented of unregulated gene therapy, a risky undertaking that is being embraced by a few daring individuals seeking to develop anti-aging treatments. The gene Hanley added to his muscle cells would make his body produce more of a potent hormone—potentially increasing his strength, stamina, and life span. Should people be able to experiment on themselves using gene therapy without the FDA's sign-off? Hanley, 60, is the founder of a one-man company called Butterfly Sciences, also in Davis. After encountering little interest from investors for his ideas about using DNA injections to help strengthen AIDS patients, he determined that he should be the first to try it. “I wanted to prove it, I wanted to do it for myself, and I wanted to make progress,” says Hanley. Most gene therapy involves high-tech, multimillion-dollar experiments carried out by large teams at top medical centers, with an eye to correcting rare illnesses like hemophilia. But Hanley showed that gene therapy can be also carried out on the cheap in the same setting as liposuction or a nose job, and might one day be easily accessed by anyone. To pull off his experiment, Hanley used his scientific knowledge and part of his life savings. He put his insider know-how to work to procure supplies, order blood tests, win the sign-off of a local ethics committee, and engage a plastic surgeon who helped givehim two treatments, a small dose in 2015 and then a larger one last June. In 2015, we wrote about the case of Liz Parrish, an entrepreneur without a background in biology who claimed to have received a dose of gene therapy in Latin America. Parrish briefly worked for Hanley, whom she knew from anti-aging meetings. At least one additional person who underwent self-administered gene therapy is a U.S. biotech executive who did not want his experience publicly known because he is dealing with the U.S. Food and Drug Administration on other matters. Hanley says he did not secure the approval of the FDA before carrying out his experiment either. The agency requires companies to seek an authorization called an investigational new drug application, or IND, before administering any novel drug or gene therapy to people. “They said ‘You need an IND’ and I said, ‘No, I don’t,’” recalls Hanley, who traded e-mails with officials at the federal agency. He argued that self-experiments should be exempt, in part because they don’t pose any risk to the public. That’s not to say gene therapy is without dangers, such as immune reactions. “I spent years doing very little else other than iterating designs and thinking of all the ways something could go wrong,” he says. When I met him on Stanford University’s campus to discuss his project, Hanley zipped open his cargo pants to show me three black dots tattooed on his left thigh, marking the site of one of the injections. Had the gene therapy gone haywire, he says, his fail-safe option was to have the affected tissue surgically removed. During a day I spent with Hanley in Menlo Park, he seemed to burst with energy, several times colliding with me as we tried to walk through doors. Was it the gene therapy at work, an excitable personality, or just a show? “I think getting near Spider-Man-like transformations of people is potentially possible,” he says of gene therapy. Most often, this approach relies on viruses to shuttle DNA into a person’s cells. Hanley opted instead for a simpler method called electroporation. In this procedure, circular rings of DNA, called plasmids, are passed into cells using an electrical current. Once inside, they don’t become a permanent part of person’s chromosomes. Instead, they float inside the nucleus. And if a gene is coded into the plasmid, it will start to manufacture proteins. The effect of plasmids is temporary, lasting weeks to a few months. Because of its relative simplicity, the same technique is now eyed as a novel way to quickly deliver vaccines in response to emerging diseases. In August, the U.S. National Institutes of Health began dosing volunteers with a plasmid containing parts of the Zika virus. Hanley took the technique in a different direction, poring over decade-old studies by a company called VGX Animal Health that had tried zapping plasmids into the muscles of cows, dogs with kidney disease, and baby piglets. They’d explored adding extra copies of the gene for growth-hormone-releasing hormone (GHRH)—a molecule that is normally made in the brain. One of its roles is to travel to the pituitary gland, where it acts as a regulator of growth hormone itself, telling the body to make more. It also appears to have an array of other roles, including enhancing the immune system. Hanley says he designed a plasmid containing the human GHRH gene on his computer, with the idea of developing it as a treatment for AIDS patients. But no investors wanted to back the plan. He concluded that the way forward was to nominate himself as lab rat. Soon he located a scientific supply company that manufactured the DNA rings for him at a cost of about $10,000. He showed me two vials of the stuff he’d brought along in a thermos, each containing a few drops of water thickened by a half-milligram of DNA. In planning his study, Hanley skipped some steps that most companies developing a drug would consider essential. In addition to proceeding without FDA approval, he never tested his plasmid in any animals. He did win clearance for the study from the Institute of Regenerative and Cellular Medicine in Santa Monica, California, a private “institutional review board,” or IRB, that furnishes ethics oversight of human experiments. But ethicists not involved in the study see a significant omission. “If I found out only after I approved a protocol that it was intended to be self-experimentation, I’d be seriously unhappy,” says Hank Greely, a law professor at Stanford University. “That is definitely the kind of thing an IRB should know about.” He says the issue is one of potentially impaired objectivity, as when a physician proposes to treat family members—except even more so, since Hanley is the designer of the therapy as well as its recipient, and may be financially dependent on the outcome. “One thing you have when you’re experimenting with yourself is a very, very deep conflict of interest,” says Greely. When I asked Hanley for proof the treatment had actually occurred, he obliged by providing documentation and playing for me a video of the experiment he had stored on his laptop. In it, Hanley appears sitting in his undershorts in a doctor’s office. The scene, recorded in June, shows the surgeon from the elbows down, wearing shorts, running shoes, and white exam gloves. The two met at a gym working out, Hanley says. Off screen, a female friend of Hanley’s makes small talk as large ice packs are laid on his thighs. “How are you feeling?” the doctor asks. “A little nervous,” Hanley replies. Also watching the experiment that day, via Skype, was Bobby Dhadwar, a postdoc in Church’s Harvard laboratory, which Hanley has kept abreast of his plans. “When I first heard someone is going to electroporate themselves, I thought they had to be kidding. It’s usually something we do to animals,” says Dhadwar. This time, Hanley had opted to take six milligrams of the tranquilizer Xanax and got local anesthetic in his thighs. The doctor can be seen placing a plexiglass jig built by Hanley onto the biologist’s thigh. The doctor leans in with a hypodermic needle to inject the sticky solution of GHRH plasmids into the designated spot. He also uses the jig to guide the two electrodes, stiff sharp needles the size of fork tines, into the flesh. The electrodes—one positive, one negative—create a circuit, a little like jump-starting your car. In the video, Hanley’s thigh shudders as the current is turned on, his cells open momentarily, and the DNA rings slip inside. “That was better than last time,” he’s heard saying. Three weeks after the treatment in June, Hanley’s diary records that he flew to Boston. By the morning of June 28 he had arrived at Church’s Harvard lab, where he spent two weeks at a vacant desk. The geneticist, who enjoys millions in NIH grants, has a large program testing 45 different gene-therapy interventions in mice to see which extend their lives the most, or even reverse aging. Dhadwar told me the lab had received blood samples from both Hanley and Parrish and was carrying out measurements to determine whether new genes were active in their bodies. He said in Hanley’s case levels of GHRH appeared elevated, suggesting that the treatment had had an effect, although he cautioned that his results are not definitive. So what happens next? The U.S. Food and Drug Administration could get involved, intervening with warning letters or site visits or auditing his ethics board. The plastic surgeon—whose name Hanley wished to keep confidential—could face questions from California’s medical board. Companies that supply plasmids might start taking a closer look at who is ordering DNA and what they plan to do with it. Or perhaps authorities will simply look the other way because Hanley experimented on himself. The kind of attention Hanley is hoping for, he says, is from investors. Maybe someone will fund a larger study, or perhaps there is a wealthy person interested in paying for his treatment. Long life, twice a week get plasma from a 20 is year old. BOOM, healthy till you die. In June 2016, Church indicated that first phase I aging reversal human trials could be in a year or two. Fahy: Using your most favorable pathway for intervention, how long will it take before a human trial might be possible? Church: I think it can happen very quickly. It may take years to get full approval, but it could take as little as a year to get approval for phase one trials. Trials of GDF11, myostatin, and others are already underway in animals, as are a large number of CRISPR trials. I think we'll be seeing the first human trials in a year or two. While discussing creating a hybrid elephant - wooly mammoth using CRISPR genome editing, Harvard's George Church predicted that reversal of aging will be a reality within ten years. Nextbigfuture suspects that this would likely be reversing aging in mice cells as a proof in principle. But maybe he does mean full reversal in humans. Fahy: Can you say what those trials might be? Church: I helped start a company called Editas that is aimed at CRISPR-based genome editing therapies in general. Some of those will be aimed at rare childhood diseases and others hopefully will be aimed at diseases of aging. We also have a company focused specifically on aging reversal that will be testing these therapies in animal and human models. Fahy: If aging is driven by changes in gene expression, then the ability to control gene expression using CRISPR technology could have profound implications for the future of human aging. Why do you think aging may be at least partly driven by changes in gene expression? Church: We know that there are cells that deteriorate with age in the human body and that we have the ability to turn those back into young cells again. This means we can effectively reset the clock to zero and keep those cells proliferating as long as we want. For example, we can take old skin cells, which have a limited lifetime, and turn them into stem cells (stem cells are cells that can turn into other kinds of cells) and then back into skin cells. This roundtrip results in the skin cells being like baby skin cells. It's as if my 60-year-old cells become 1-year-old cells. There are a variety of markers that are associated with aging, and those all get reset to the younger age. Fahy: That's fantastic. Does this mean that reversing skin cell aging in your face would allow you to rejuvenate your entire face? Church: If you rejuvenate at a molecular level, it doesn't necessarily mean that everything else rejuvenates. So, for example, if my face has a scar on it, it's not going to necessarily reverse that (although theoretically it's not out of the question). But we can reverse the tendency of your cells (and therefore of your whole body) to deconstruct when you reach your life expectancy. Fahy: If aging is driven by changes in gene expression and those changes in gene expression can be reversed, then we need to be able to find all of the important age-related changes in gene expression as quickly as possible. How can this be done? Church: Gene expression results in each cell having specific RNAs and proteins, and these can be surveyed. You don't necessarily have to define every single RNA in a particular cell to understand that cell, but you can, and we have in fact developed a new method to do this that allows us to see all of the tens of thousands of RNAs in a single cell at one time, and to see the RNAs in neighboring cells as well. So now we can see how different cells relate to one another in context. This new method, called fluorescent in situ sequencing, or FISSEQ, allows us to count all the RNAs in a cell while simultaneously counting all of the RNAs in all of the cells it touches. Plus, we get the 3D coordinates for every RNA molecule in every cell. Fahy: That's unbelievable. How can you use this method to search for changes that are related to aging? Church: Suppose there are two different kinds of cell, and we want to know what gene expression states make them different from one another. We can first compare the two cells using FISSEQ in order to determine the differences in gene expression between them. Next, we can pick specific differences we think cause the cells to be different cell types, and change the expression of those particular genes in either or both cells using, for example, CRISPR, and see if we can change one kind of cell into the other. Even if we don't get it right the first time, we can take many guesses as to what the important RNAs are and just how much to tweak them until we do get it right. The same principle can be applied to any pair of cells. By comparing old cells to young cells, we can find out what makes an old cell an old cell, and how to turn an old cell into a young one. Church: One of the problems with studying development and aging is that it takes a long time. But if we know the epigenetic state of all these different cells, no matter how many years apart they are, it only takes a few days to reprogram a cell and duplicate the effects of decades of slow change in the body, or reverse those effects. So in principle we could turn a young cell into an old one or an old cell into a young one because the only difference between them is epigenetics, or gene expression. Fahy: What other ways are there to identify powerful gene targets for intervention into human aging? Church: There are basically four good ways to find key gene targets. First, we can look at genes that underlie person-to-person variability in such things as low risk for viral infections, diabetes, osteoporosis, and so forth. The most extreme example here would be to compare normal people to super-centenarians, those who live to the age of 110 or older. They might have genes that are protective enough to find even with a small number of individuals, or even with a single individual. There are hundreds of genes that have small effects, but then way out on the end of the bell curve is something like the myostatin double null mutant or human growth hormone over/under production. Genes that have gigantic effects and completely dominate the effects of small environmental and small genetic influences are the right kind of gene to look for. The second way to find the best gene targets is to pick from discoveries made from basic studies like the GDF11 and TFAM that we talked about earlier. A third way is to use a specialized highly genomic strategy, such as mutating thousands of genes one by one to see if any of these mutations block aging, or using the FISSEQ method we discussed earlier. The fourth way to identify powerful gene targets is to compare closely related animals, one of which ages much more slowly than the other (like naked mole rats vs. rats). No matter where you get your lead, you don't have to worry about having too many hypotheses. Just use CRISPR to activate or inhibit that candidate gene and look for the biomarkers of aging reversal we discussed earlier. The idea is to see whether your change has an impact or not, and whether it acts synergistically with the other things that have been shown in the past to have an impact. Fahy: So if we saw something unusual or provocative in super-centenarians, we could create the same change in, for example, a normal human cell line and observe whether the right longevity pattern emerged. Fahy: I've been told by James Clement, who is being funded by the Life Extension Foundation to do collaborative work with you on the genetics of super-centenarians (See sidebar: Life Extension Foundation Funding of CRISPR Research), that you might even be able to take super-centenarian gene expression patterns and put them into mice and see if the mice age more slowly. Church: Right. Our protocol will likely be to collect leads from the four different sources and try them out first on human cells. By going straight to human cells, we won't get into the trap of spending years working on mice, which is rather expensive, only to find out that it doesn't work in humans. We can actually do a cheaper and more relevant study in human cells, confirm them in mice, then test them in larger animals, and then in humans. I think that going from human cells to mice and back to humans is likely to save us time and money. Many human cellular testing systems are getting better and better, such as "organs on a chip" or organoids, which are getting to be more and more representative of in vivo biology. Fahy: To reverse human aging, CRISPR technology will ultimately have to be applied in the whole body, and not just to cells in a test tube. 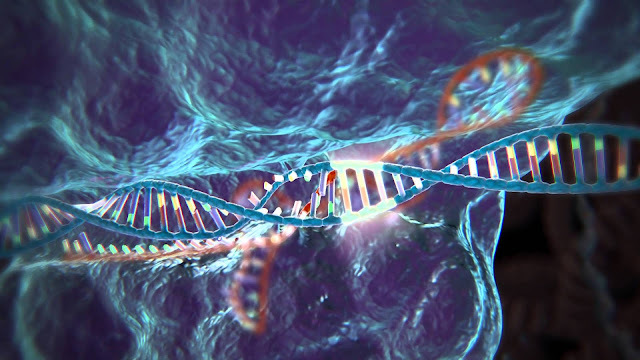 How feasible is it to apply CRISPR technology in the intact body? Church: Gene therapy can be based on either ex vivo manipulations, in which cells are removed from the body, genetically modified, and then put back into the body, or on in vivo (within the body) methods, in which, for example, a modified virus might be used to carry a gene package into many different cells in the body. Each of these methods has pros and cons. There are viral and non-viral delivery systems that could be used to deliver CRISPR constructs and that will leave the blood vessels and go into the tissues. The delivery system could contain the CRISPR plus guide RNA plus the donor DNA (See sidebar: Gene Editing with CRISPR), or it could just comprise the CRISPR, guide RNA, and protein activator, and so on. But whether it's a viral delivery or a non-viral delivery method, the total mass of gene editing devices that has to be delivered will have to be considerable. But there is no rush, you can deliver them slowly. Fortunately, there are ways to manufacture biologicals that are dirt cheap. Things like wood and even food and fuel are all roughly in the dollar-per-kilogram range. If we could similarly make a kilogram of a viral delivery system and load it up with CRISPR, then it could become inexpensive enough to apply to the whole body. Fahy: Yes, a kilogram would be plenty! So, the viral delivery system contains a gene for CRISPR, a separate gene for the guide RNA, etc. When it delivers these genes to the cell, the cell makes the resulting proteins and nucleic acids, and all of the components simply assemble all by themselves in the cell, is that right? Fahy: Which is the best CRISPR delivery system? Church: Adeno-associated viruses (AAV) are one of the favorite delivery systems right now because they can be nudged into going to tissues other than the liver (where many other delivery systems end up) more readily. This is an active field of discovery. It's moving quickly, and the CRISPR revolution just made it an even more desirable field to study. Fahy: There are several very exciting stories in aging intervention these days. In 2013, the Sinclair lab at Harvard came out with the revelation that the aging of mitochondria (which are the producers of usable energy within cells) is driven in significant part by reduced levels of one particular molecule in the cell nucleus: oxidized NAD (NAD+). The team showed that they could correct mitochondrial aging just by giving old mice nicotinamide mononucleotide (NMN), which is a vitamin-like substance that can be converted into NAD+, for one week. This resulted in phenomenal overall rejuvenation, including reversal of signs of muscle atrophy, inflammation, and insulin resistance. Now your lab showed that there is a very exciting gene engineering alternative involving TFAM (Transcription Factor A, Mitochondrial). Why is TFAM important, and what have you done with it? Fahy: With this technique, you were able to increase TFAM levels in the cell by 47-fold. This resulted in restored ATP levels, increased NAD+, and an increased NAD+ / NADH ratio. It also increased total mitochondrial mass and reversed several other age-related changes. Church: Yes. We have a number of ways to measure mitochondrial function and age-related losses of those functions. When we activated TFAM, these changes returned to what you would expect of a younger cell state. And we built this anti-aging ability into the cell, so it's self-renewing and eliminates the need to take pills or injections. Its becoming clearer that mitochondrial DNA damage is the root of aging. The other things such as lysosomal aggregate accumulation, accumulation of senescent cells, and the like are likely secondary effects. Church's CRISPR Cas9 may fix this problem. Another approach, MitoSENS, is to simply relocate those 13 genes into the cell nucleus and order to effect self-repair. I'm thinking that a CRISPR Cas9 related technique to repair those gene in sitsu, without relocating them into the cell nucleus, might be the best way to go. There are probably other methods I'm not aware of that can accomplish the same things. Eventually we will be regenerating our bodies with synthetic stem cells. What is very clear is that aging is curable and ought to be curable within the next 3-4 decades. If you think you cannot hang on this long, I would consider Plan B, which is cryo-preservation. The Alcor Foundation (http://www.alcor.org) is worth checking out. The notion that aging is somehow immutable is pure ideology, not science. The best part of all of this is that it will eventually be done in a home lab. Call it DIY age reversal. Human trials of NMN therapy will begin within six months. “This is the closest we are to a safe and effective anti-aging drug that’s perhaps only three to five years away from being on the market if the trials go well,” says Sinclair, who maintains a lab at UNSW in Sydney. UNSW researchers have identified a critical step in the molecular process that allows cells to repair damaged DNA – and it could mean big things for the future of anti-ageing drugs, childhood cancer survivors and even astronauts. It could lead to a revolutionary drug that actually reverses ageing, improves DNA repair and could even help NASA get its astronauts to Mars. Their experiments in mice suggest a treatment is possible for DNA damage from ageing and radiation. It is so promising it has attracted the attention of NASA, which believes the treatment can help its Mars mission. While our cells have an innate capability to repair DNA damage − which happens every time we go out into the sun, for example – their ability to do this declines as we age. The scientists identified that the metabolite NAD+, which is naturally present in every cell of our body, has a key role as a regulator in protein-to-protein interactions that control DNA repair. Treating mice with a NAD+ precursor, or “booster,” called NMN improved their cells’ ability to repair DNA damage caused by radiation exposure or old age. “The cells of the old mice were indistinguishable from the young mice, after just one week of treatment,” said lead author Professor David Sinclair of UNSW School of Medical Sciences and Harvard Medical School Boston. For the past four years, Professor Sinclair and Dr Wu have been working on making NMN into a drug substance with their companies MetroBiotech NSW and MetroBiotech International. The human trials will begin this year at Brigham and Women’s Hospital, in Boston. The findings on NAD+ and NMN add momentum to the exciting work the UNSW Laboratory for Ageing Research has done over the past four years. They’ve been looking at the interplay of a number of proteins and molecules and their roles in the ageing process. They had already established that NAD+ could be useful for treating various diseases of ageing, female infertility and also treating side effects of chemotherapy. In 2003, Professor Sinclair made a link between the anti-ageing enzyme SIRT1 and resveratrol, a naturally occurring molecule found in tiny quantities in red wine. “While resveratrol activates SIRT1 alone, NAD+ boosters activate all seven sirtuins, SIRT1-7, and should have an even greater impact on health and longevity,” he says. An unexpected function of the oxidized form of nicotinamide adenine dinucleotide (NAD+) could underlie some effects of aging and propensity to age-related diseases. Li et al. found that the protein DBC1 (deleted in breast cancer 1) contains a domain that specifically binds NAD+. Binding of NAD+ inhibited the interaction of DBC1 with PARP1 [poly(adenosine diphosphate–ribose) polymerase 1], an enzyme important in DNA repair. Activity of PARP1 is inhibited by interaction with DBC1. Thus, the reduced abundance of NAD+ associated with aging may decrease PARP1 activity by promoting the interaction of PARP1 with DBC1. This mechanism could help explain the reported rejuvenating actions of NAD+ supplementation in older animals. DNA repair is essential for life, yet its efficiency declines with age for reasons that are unclear. Numerous proteins possess Nudix homology domains (NHDs) that have no known function. We show that NHDs are NAD+ (oxidized form of nicotinamide adenine dinucleotide) binding domains that regulate protein-protein interactions. The binding of NAD+ to the NHD domain of DBC1 (deleted in breast cancer 1) prevents it from inhibiting PARP1 [poly(adenosine diphosphate–ribose) polymerase], a critical DNA repair protein. 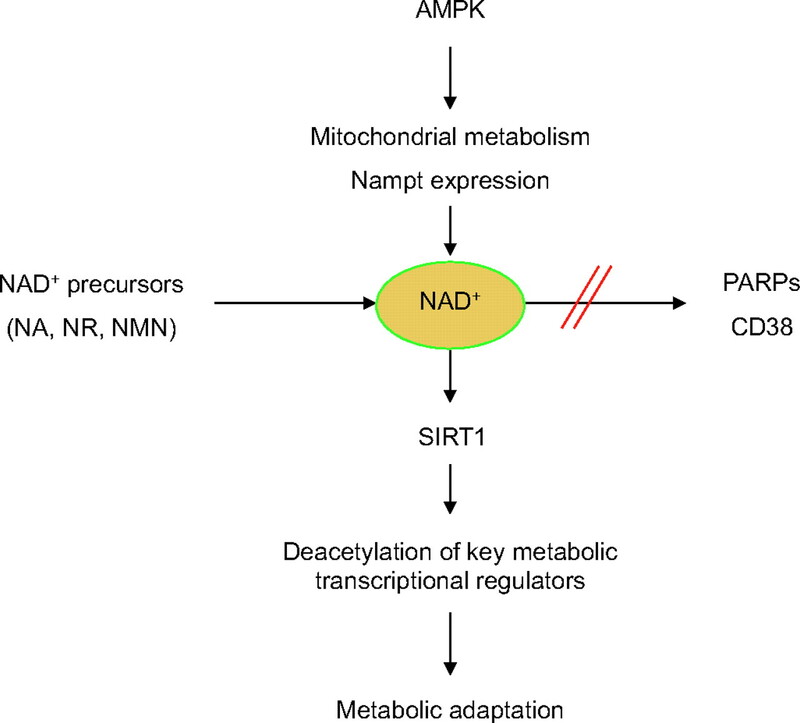 As mice age and NAD+ concentrations decline, DBC1 is increasingly bound to PARP1, causing DNA damage to accumulate, a process rapidly reversed by restoring the abundance of NAD+. Thus, NAD+ directly regulates protein-protein interactions, the modulation of which may protect against cancer, radiation, and aging. When Will We Successfully Reverse Aging? Throughout the course of human history we’ve developed marvelous means to protect ourselves from illness and injury: ailments and afflictions that once commonly took lives are now a thing of the past, are easily treatable and preventable through modern medical science — and some scourges have been downright eradicated. The one thing we have no seemed to get a handle on – that will ultimately be fatal for humans even if specific diseases are not — is time. Our centuries-long quest for the fountain of youth has led us from myth to magic and now, into the science lab where researchers are unlocking the mysteries of aging — and perhaps getting closer to not only stopping it, but reversing it. Through DNA, researchers have been able to identify the genes responsible for aging. The genes that are the culprits in human aging can then be manipulated using advanced technologies like CRISPR, with remarkable success. Others are using “young blood” to revitalize the old. Some are harkening back to the legends of our ancestors, who also attempted to devise ways to address the problem of aging: today, researchers are developing anti-aging treatments based on everything from cannabis to a bacteria native to Easter Island. In recent decades, science and technology has advanced so rapidly that, while human beings may still be inevitably aging in the interim, the prospect of solving the problem of aging is closer in reach than it’s ever been before: back in December of 2016, researchers at the Salk Institute successfully reversed the process of aging in mice and predicted that they would be ready for human trials within ten years. The research at the Salk Institute not only made the mice look younger, it extended their lifespan by an average of 30 percent. This was similar to findings from research by the Buck Institute for Research on Ageing and the University of Washington back in 2015 which found that through deleting particular genes in yeast they could extend the organism’s lifespan by up to 60 percent. The science at work not just in this altered course of human aging, but the natural course is well, is epigenetics. Throughout life, our genes can be altered in a number of ways; often by things we’re exposed to as a result of our environment (pollution, for example) or lifestyle (like cigarette smoke). As our genes change, so do our bodies —and so do we. Whether it means we develop a condition for which we had a genetic predisposition all along, or we are acquire one our bodies are not able to recover from, these epigenetic changes provide clues as to why, and how, these processes take place. They are also, then, where we are most likely to find the answers we need to stop or reverse them altogether. Juan Carlos Izpisua Belmonte, an expert in gene expression at the Salk Institute, put it rather frankly when he spoke to Scientific American: “Aging is something plastic that we can manipulate.” The question for researchers was how to do that — and the answer, it turned out, was through transforming adult cells back into an earlier state; a much earlier state. Embryonic, in fact. At this stage, cells possess the capacity to differentiate into any type of cell in the body, which has made them the focus of stem cell research. At Harvard University, Dr. David Sinclair and his team of researchers determined that an anti-aging compound called nicotinamide adenine dinucleotide (NAD+) was found more frequently in younger mice than older ones. NAD+ is an important part of how our DNA repairs damage — which can occur for a multitude of reasons, including being a somewhat natural part of the cellular division process. The magical DNA-repair compound, PARP1, responds to levels of NAD+ in the body: the higher the NAD+, the more PARP1. Younger people, like mice, have more and our levels decrease as we age — meaning it becomes harder for our DNA to repair itself. That, in turn, leads to aging, illness, and all the other physical inevitabilities of humanhood. Youthereum Genetics believes aging is ultimately controlled by the hypothalamus, just like all other aspects of ontogenesis. The information for this article is from an interview at Fightaging. This concept dates back to the 1950s and is described in detail in the works of Dilman, Frolkis and Everitt’s. Recent research by Dongsheng Cai and his colleagues provides further evidence for the hypothalamic hypothesis. On the cellular level, aging is most likely both tracked by and executed via epigenetic regulation of gene expression. Several years ago it was first observed that a person’s age is highly correlated to his/her epigenetic profile. Later it was recognized that these ‘epigenetic clocks’ are effective life expectancy predictors, which confirmed that epigenetics is a key component of the aging process. Many organisms were found to have such ‘epigenetic clocks’ that are highly correlated with both their age and probability of death. Moreover, Nature knows how to roll back or even completely reset the epigenetic clock. This is done for every new embryo and is most likely the reason why every new animal is born young despite having started as an oocyte cell of the same age as its mother. Experiments with epigenetic rejuvenation which demonstrated that rolling back epigenetics rejuvenates not just individual cells but entire organisms (and prolongs their lifespan) have confirmed that epigenetics is not just a consequence but an important driver or aging. This is where Youthereum Genetics comes in. Based on the recent work of Juan Carlos Izpisua Belmonte’s group at Salk, who have shown that periodic induction of OSKM transcription factors can prolong lifespans of progeric mice by up to 50%, we hypothesize that aging can be rolled back by periodic epigenetic rollbacks. Our strategy is aimed at translating this hypothesis into a safe therapy that produces sizable, noticeable rejuvenation in humans. The body has enough capacity for self-repair to function at the level of a 25-year-old for hundreds if not thousands of years, or maybe even longer. If the germ line can do so for billions of years, periodically generating a new organism from scratch. Aubrey de Grey, who is one of their advisors, despite being a staunch opponent of the programmed hypothesis, also believes epigenetic rollback holds therapeutic promise. In his view, the ability to rejuvenate the aged body by reactivating early-life pathways does not in any way conflict with the idea that aging is unprogrammed and results from the gaps in our anti-aging machinery rather than the presence of actively pro-aging machinery. I would be more than happy to be proven wrong on the underlying mechanisms of epigenetic rejuvenation as long as it provides us with a lifespan extension comparable to that seen in Belmonte’s work. Belmonte showed that there is a Goldilocks zone of OSKM induction that extends lifespan without producing teratomas, cancer risk of this approach was thought to be prohibitive for its translation. Apparently, it isn’t. The trick is to roll the cells back ever so slightly to prevent them from de-differentiation, but to do so often enough to prevent (or at least slow down) the accumulation of age-related damage that results from the relentless downregulation of damage repair mechanisms with age. (3) creation of the best means of gene delivery, preferably patentable. In order to reliably rejuvenate the entire body, we need to periodically roll back the epigenetic clock of most cells in the body, if not all cells. Thanks to the work of Belmonte’s group, we know that this is possible by delivering OSKM factors (or other transcription factors) into the cell. However, this is a tricky endeavor: roll back too little and you get no sizable effect; roll back too much and you might get cancer, as cells would lose their identity and become pluripotent again. After all, their ability to turn cells back into pluripotent state was the main selection criterion for picking the 4 OSKM factors from the original 24 candidates. So, while OSKM factors are effective and represent a “bird in hand”, they are far from ideal for our purposes. We should strive to find better, safer epigenetic rollback factors; we plan to start by revisiting the remaining 20 factors of Yamanaka’s original 24, and also try to use the Oct4 factor alone, since there is evidence that it alone is able to roll back epigenetics and is generally the main “guardian of the epigenetic gates.” However, narrowing down the factors is only half of the challenge. Delivering them safely and, ideally, cheaply is the other half. The epigenetic aging program is quite robust even in the face of weekly rollbacks, as demonstrated by Belmonte et al., therefore, obtaining meaningful rejuvenation in humans would most likely require monthly or even weekly induction of epigenetic rollback factors (whether OSKM or otherwise). The most cost-effective way of achieving this would be to integrate a special, normally silent polycistronic cassette containing the genes for the rollback factors into virtually each cell of a patient. Such a cassette would be activated by a unique and normally inert custom agent that would need to be developed separately, and would enable this approach to be patentable. Today such cassettes are activated by, for example, tetracycline or doxycycline. With this approach, the marginal cost of a weekly induction of rejuvenating factors would only be the cost of the induction agent (presumably, a small molecule or a peptide) - comparatively cheap.They want to get the investigational new drug stage in 5-6 years and then license to Big Pharma.. Very interesting if it pans out...still not sure how it would work on Brain/CNS cells since they don't divide (much)?